Crucible Copper/bronze Melting Furnace/Machine is widely use in the foundry industry, with the IGBT/KGPS Technology, which can smelt scrap copper with capacity 10kg to 100000KG per batch. and melting time for each pot is around 60 minutes. Our power supply adopt the most advanced IGBT technology from Germany which is the most energy saving and environmental method to melt the copper Scrap. Copper is a transition metal that easily carries out heat and also electrical energy, making it an useful compound in the building of various items. Copper is melted either as ingots for storage space or sale, or for casting another things, such as jewelry. Induction heating system. Due to the fact that copper has a high melting temperature level of 1083 ° C (1981 ° F), induction furnaces are commonly required. Although extremely expensive industrial equipments, induction heating systems will certainly assure for a level of security that is not present in self-constructed foundries. 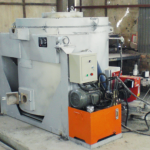 And Usually Tilting Induction Melting Furnace are typically used in commercial settings. They continuously melt large amounts of copper and also are automated to pour into a ceramic container or any kind of wanted steel cast/mold. 1. Melting capacity range from 0.2 ~ 5 tons. 2.Come with Several protection functions to ensure safety. 3. Open type furnace hearth reduces moisture to extend furnace lining life. 1. Melting capacity range from 10kg~100kg. Small light, a lot of models can be selected to melt different amount of metals. 3. Not only suitable for the factory, but also suitable for the college, researching companies to use. 2. A remote tilting control trolley provides more safe and convenient titling control. 3. Steel structure ensure the machine in a long life working. ● All functions can be microcomputer controlled by touch screen. ● Digital power adjustment and indicator. ● High efficiency using a solid-state generator. ● Self-diagnostics system,Stainless steel construction. ● Control of the temperature (option) with thermocouple or optical sensor. COOLDO power supply is designed with reliable circuit protection, the electrical components work in a safe range,decrease the damage rate and increase the life obviously. The electrical control board takes use of the high reliability digital circuit. In the operation, the 3-phase current is balanced. Due to the advanced design, the 3-phase power supply’s sequence could be connected randomly.Anymore there is also no limit to connect to capacitor cabinet and furnace. All of these jobs can be judged to adapt automatically by the device itself. It lets the installation and maintenance very easily.. When the crucible is cold(first melt),40~50min./ workload.